After using an iPhone 3GS and now an iPhone 4 for several years now, I really cannot be without this device but I'm always conscience of either dropping it or having it scratched. This is where cases come into the mix that generally offers the protection needed for your iPhone 4 on a daily basis. But apart from safety, it also makes your iPhone 4 a fashion accessory and the Aviator Aluminium case from Cygnett is really a bold fashion statement. My favourite aspect of the Aviator is its sleek metallic finish. Even though the iPhone 4 looks impressive without any cases, the Aviator really stands out from its metallic, almost alien-like design. Even better is that the Aviator comes in two metallic colours that include silver and blue. We reviewed the silver unit from Cygnett and the installation process was quite simplistic as we clipped our iPhone 4 into the case. The only issue with the Aviator is attempting to install the screen protector on your iPhone which is always the trickiest thing. I'm just pedantic and want to ensure that the minimal amount of air bubbles appear. If a bubble does appear, all you need to do is press down with a card to smooth them out. Design wise, the Aviatar is actually a brushed aluminium finish and is not a faux metal. When connected to the Aviator, we could not detect any additional weight and like all Cygnett cases, we had full access to the iPhone 4. This meant, all exterior buttons, camera and dock/charger port. Add in a 2-years manufacturer's Warranty and not only does it offer your iPhone 4 protection from every day bumps, knocks and scratches but you'll look quite savvy in the process. 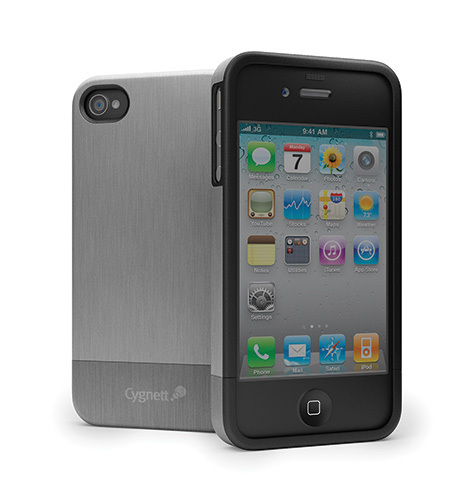 The Aviator Aluminium case for iPhone 4 by Cygnett has everything iPhone 4 users need and I must admit that is easily the best design I've reviewed, due to its metallic exterior. From a cool case to a screen protector and microfiber cleaning cloth to 2 years warranty, why not do yourself a favour and grab the Aviator Aluminium case for iPhone 4, you'll definitely turn some heads.